The Aetherium Forge is an ancient Dwemer forge, guarded by several Dwarven automatons. Access is gained during the quest Lost to the Ages via the Ruins of Bthalft. After defeating some lesser Dwarven automatons, you will encounter The Forgemaster, a unique Dwarven Centurion that has a Flame Cloak-like power and shoots flames or a fireball instead of steam. After defeating it, you can obtain extra materials in a nearby chest to use at the Aetherium Forge. You can create three different items but can use the forge only once. The Aetherial Shield is a heavy shield that makes enemies become ethereal (unable to attack or be attacked) for 15 seconds when shield bashed. Lost to the Ages: Search for the Dwemer's Aetherium Forge. You enter via a lift down; at the bottom, before activating a lever to the right of the gate to open it, turn to your right and jump over a low wall. Follow the wall around to the right to find a Dwemer chest with an apprentice-level lock. In front of you is a stone pool of water with a piece of Dwemer scrap metal on the edge of the pool. As you follow the path down several flights of stairs, braziers will light your way. After you descend the third set of stairs, you will face the start of a rock bridge, while, to the left, a path leads down to the water. Heading due south from the bottom of the ramp and staying against the wall at the bottom, there lies a skeleton with a Dwarven sword and an empty random soul gem nearby. Also behind the waterfall is an adept-locked chest. Crossing the first span of the bridge, you will come to a stone wall with a large sculpture of a Dwemer face. There is a Dwemer cog, a Dwemer gear, a piece of Dwemer scrap metal, a large decorative Dwemer strut, a Dwemer gyro, and two rubies. Behind the wall with the face sculpture, drop down to a ledge to find another apprentice-locked chest. Cross the second span of the bridge and pass through a stone arch. In front of you are two flights of stairs, separated by a large stone wall leading up. On the outside of the stairs are statues of Dwarven spheres. Turning left and following the cliff edge, you will eventually come to a juniper tree; just to the right is an enchanted Dwarven battleaxe. Going back to the stairs and climbing the first flight of them leads to a higher level; between the two sets of stairs are four stone benches facing a statue very similar to the one that you had to place the shards into to gain access. To the right of the first flights of stairs is a raised area that can be accessed by climbing three or four steps up the second flights of stairs and jumping up. Among the rocks you will find an inert Dwarven spider worker underneath another juniper tree. Climbing the second flight of stairs will bring you to a courtyard area with a dead tree in the center. On the left against the south wall is a stone table and bench; on the table is a Dwemer cog, a piece of solid Dwemer metal, a large Dwemer strut, a piece of Dwemer scrap metal, a piece of bent Dwemer scrap metal, and a Dwemer gear. Further along this wall, in a pile of rubble, you will find another adept-locked chest. Against the north wall opposite the first table and bench is a matching one; this one holds a Dwarven bow, and opposite the caved in part of the south wall is a stone arch that leads to a stream being fed by a waterfall. There is a glowing mushroom growing under the arch, and beyond it, there are one each of Namira's rot and fly amanita, with a second fly amanita growing next to the water's edge at the start of a ramp leading down into the water. However, it might not be possible to interact with this growth. Following the shore east, you will find a white cap and another fly amanita growing, as well as two silver ore veins. Just past the second of these is a stone arch with two more glowing mushroom growing on it. In the water at the very bottom, before it drops over a waterfall, is a random, filled soul gem. There is a skeleton in the water against the west wall with a random weapon and a small coin purse next to it. There is also an expert-locked chest on the north shore of the stream. Going southwest from the arch will lead you to the second juniper tree seen earlier, also providing a quick way back to the courtyard. The way forward is through a gate in the western wall. It has two kinetic resonators above it, one on either side; shooting both of these with a missile, either physical or magic, will open the gate. Passing through the gate will bring you to the top of a flight of stairs with a stone bench on your right. At the bottom of the stairs there is a door to the south, with a scuttle on your left. There is a potion of ultimate healing, a random potion of healing, a random potion of magicka, a Dwarven helmet, and an elixir of resist fire in front of it. Through the doors, you get your first look at the forge. In order to clear the damaging steam from the room, you will need to turn it off using valves on raised platforms on either side of you. There are shallow alcoves above the two valves from which a series of Dwarven spiders and spheres will attack you. The Aetherium forge is directly in front of you. On the bottom level against the east wall is a stone table with an unlocked chest built in; on the table are two random potions (one of which is a healing potion), a pair of Dwarven gauntlets, and an enchanted Dwarven greatsword. 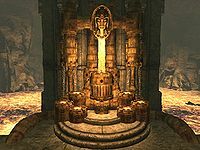 Against the west wall is a similar stone table with a Dwemer chest. On this table are three Dwarven metal ingots, a large decorative Dwemer strut, a piece of Dwemer scrap metal, a Dwemer gyro, and a centurion dynamo core. The chest contains all the items you will need to craft any one of the possible Aetherial items listed in the Smithing section of this page. On either side of the forge are ramps leading down to the lava. With high enough health, fire resistance, or using the Become Ethereal or Whirlwind Sprint shout, you can reach two additional areas across the lava. By turning outwards from the ramps and following the walls along to the end, you will reach two unlocked gates that open outwards and allow access to the two areas, both of which contain an unlocked chest and several pieces of Dwemer metalwork lying around on the ground. You can then follow the paths up to gates that allow you to drop back onto the bottom level by the two stone tables. There is also an unlocked chest up a ramp behind the large rock pillar you can see in the southeast corner of the room; stay to the right-hand side of the pillar to go up the ramp. Once you have spoken with Katria, the quest ends and the stairs that dropped and trapped you in this room will rise back into place, allowing you to leave. Multiple soul gems can be found underwater near the entrance and near the sealed gate. The spheres and spider will repeatedly turn the valves back on.